We told you that January was a very busy month for baby events, which is great news because we all love to save money. It’s often very expensive when you have a baby, although it’s those everyday essentials that tend to take its toll on your bank account. What are the next Boots Baby Event Dates? Well, the good news is that the next Boots Baby Sale kicks off tomorrow, January 16th, and ends on February 26th, and so runs for just over a month, which is great news. 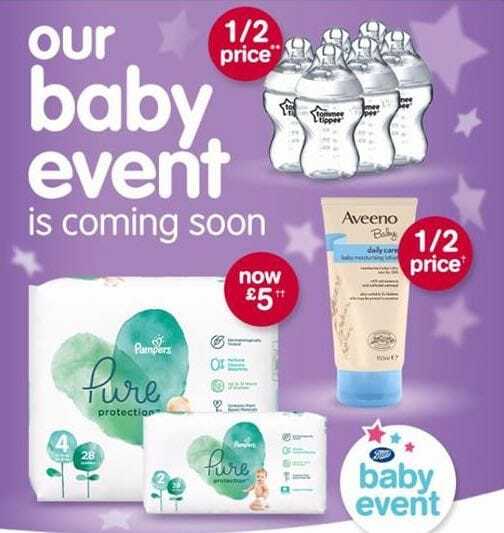 The sort of items that you can expect to see being reduced are pampers and huggies nappies, Aveeno baby range, selected Tommee Tippee essentials, Mini Club Clothing and so much more. The Asda Baby Event will be live HERE.